CHAMPAIGN — Lt. Col. Richard Helfrich served as an Army surgeon for 12 years, saved lives and got shot at. Upon his return, he pioneered in laparoscopic surgery in central Illinois. The Indiana native, now 87, graduated from DePauw University, then Indiana University Medical School, and immediately joined the Army, rather than face the uncertainties of the draft. From 1957-63, he served his internship at Valley Forge General Hospital and then his surgical residency at Tripler General Hospital in Honolulu. At Tripler, one patient was Syngman Rhee, the first president of Korea. Rhee was beyond having a conversation with at this point, Helfrich said. From 1963-65, Helfrich was chief of general surgery at Ireland Army Hospital in Ft. Belvoir, Va.
Helfrich spent a brief, dangerous time in the Dominican Republic when President Lyndon Johnson sent the 82nd Airborne to put down an insurrection. “One Friday at 11 a.m., I was alerted for this and treated my first patient at 11 p.m. in an adobe hut by the airfield,” he said. He was nearly shot by a Dominican sniper. The sniper shot from the top of a three-story building; the bullet hit the floor. During this time, Helfrich was able to watch Army snipers in action in escalating warfare. From 1965-68, he was the commander of the only U.S. hospital in Africa. This was Kagnew Station, an Army installation in Asmara, Eritrea, on the Horn of Africa. The Army Security Agency post was one of eight “listening posts” around the world. Helfrich said he was amazed at the satellite technology that no civilians knew about. The technology used at the base was state-of-the-art. At Kagnew, he “watched the May Day parade from Moscow in 1967,” Helfrich said. His hospital was caring for about 5,000 people in various units, including the Peace Corps. Kagnew Station had units of all armed forces security there, along with non-military security units, including the CIA. During this time, Helfrich said, he had a security clearance above top secret in order to be able to support these units. “We were supportive of the Ethiopian Royal Family as well as embassy and consular personnel of countries in East Africa. I was able to visit Kenya, Uganda, Sudan, Somalia, Lebanon and Egypt, as well as Yemen,” he said. “Haile Selassie signed a picture for me. There were some unique episodes, such as being on a street in Aden when a man ran by me to throw a grenade onto a passing bus,” he recalled. He was able to avoid any injury from the grenade. Strangest dinner in the Horn of Africa? He was in Cairo the week before the Arab-Israeli war began in 1967. The commanding general of the Army Security Agency awarded him the Legion of Merit. At that time, it was the highest decoration the Department of Defense could award for meritorious service, he said. From 1968-69, he was chief of general surgery at Letterman General Hospital in San Francisco, sometimes dealing with men injured in Vietnam. After that posting, he resigned his commission in 1969. “The only instruction I was given at discharge was that I was prohibited from traveling behind the Iron Curtain for 10 years,” he said. A doctor with whom he did his internship recruited him to Carle. In his lengthy career, Helfrich pioneered several minimally invasive procedures that have improved the lives of many in central Illinois. There’s even a hernia repair method named for him. Helfrich has been married, since the beginning of his service, to Gloria. They have three grown children. RURAL PESOTUM — Lt. Col. Stephen Reinhart started out No. 1 in the draft lottery but found out he liked the Army so much that he stayed in for 23 years. He served as a plain-clothes counter-intelligence officer, and later a high-ranking educator. Along the way, he also learned to fly planes and copters and did humanitarian medevacs in Arizona and Mexico. Reinhart lives on the same farm east of Pesotum where he grew up. He bought it from his dad in the 1980s. You can see a llama and an alpaca out his living room window. A three-sport athlete at Villa Grove High School, Reinhart had his radio moment in 1971, when radio comedian Larry Lujack read out that Dec. 4 was the No. 1 number in the draft. Reinhart was out cultivating beans when he heard the news. “I was hiding out in the country, and they caught me anyway,” he joked. Reinhart went to the University of Illinois, then Western Illinois University in ROTC. With his law enforcement training, he went right into counter-intelligence from there. At Fort Huachuca in Arizona as a new second lieutenant, he was trained in methods out of a spy novel and given a top special intelligence security clearance. “I can’t tell you anything about that,” he said. He can say: He learned to follow people surreptitiously, how to blend in and “how not to get caught.” He wore jeans to work. Not everyone caught on so fast. He got a new partner that same day. From 1977 to 1980, he was sent to Munich, Germany, where he took a 24-hour-a-day intensive course in German, the language his grandparents spoke. He was able to bring along his wife, Becky, whom he started dating in high school. “She actually got to go undercover with me,” Reinhart said. She could speak German, so she was given temporary security clearance. As a civilian, “they didn’t tell her anything she didn’t need to know, just how to act,” he said. He also had risky trips to Yugoslavia. Reinhart asked to go to Ranger school, but as a counter-intelligence officer, he was denied. He did go to flight school in 1980 and trained on helicopter and multi-engine planes, to become an aviation counter-intelligence officer. “My class was the first to have a woman in a plane,” he said. As platoon leader at Hanchey Army Airfield in Alabama, he was in charge of 15 pilots and scheduled 219 helicopters on a daily basis. In 1982, he became an instructor and security officer at Fort Rucker, and later commanded two aviation student companies. 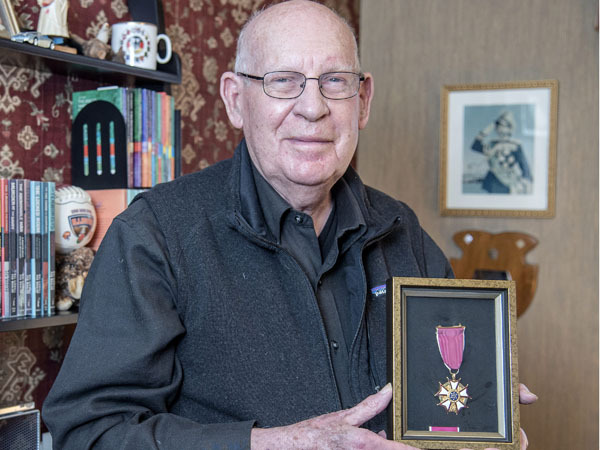 He served several roles at Fort Huachuca, including commanding medevac missions for five years. Once, he flew a 2-year-old whose heart had stopped to a hospital in Tucson in bad weather. It was a moving experience for him because he had a 2-year-old of his own. That post could also bring counter-intelligence missions, including rescuing a politician in Mexico. At other times, he piloted a helicopter that put out fires with water from bags dipped into a lake. Or he flew long missions taking high-ranking officers to New York or Washington. 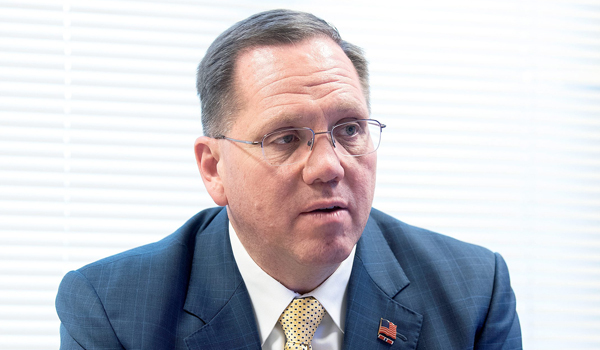 In 1988, his career took a major turn when he became an ROTC professor at Western Illinois, also serving as executive officer and recruiter, with an interruption to Fort Knox to serve as operations and marketing director for 260 universities in 16 states. Academia suited him well at the end of his military career. He became chair of the department, continuing some of his counter-intelligence work, then oversaw six departments as an assistant dean. Upon retirement, he and Becky found themselves back in the house where he grew up. “I never thought I’d come back here,” Reinhart said. He has 20 acres in Pheasants Forever and loves to see birds fly over those acres. MAHOMET — Major Mike Kessel gives God credit for saving him in Iraq after a series of ambushes. During “the Battle of Holy Week” in April 2004, his unit was under constant ambush, and he needed some spiritual advice. It ended up saving his life, he believes. Kessel grew up religious and patriotic in southern Illinois. 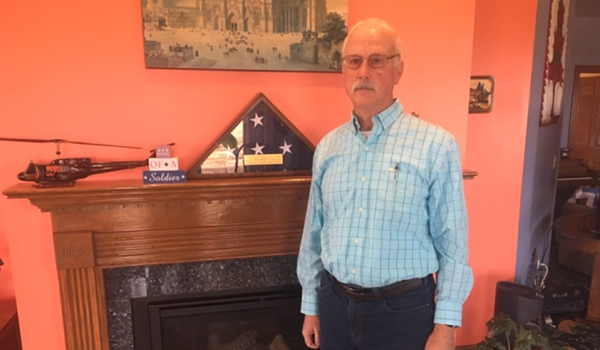 But he’s lived here as a financial adviser for 16 years, since he came to Rantoul to help found Lincoln’s Challenge Academy in the National Guard. After high school, Kessel joined the Army in 1985 and served three years. “I decided I liked it,” he said. So he went to Western Illinois University and joined the ROTC there, then he entered the National Guard for a total service of 21 years. He was called up for the first Gulf War, Desert Storm, in 1990, just two weeks short of getting his commission as an officer. So he served as a sergeant in the military police, setting up a POW camp. It was a very short operation to stop Saddam Hussein’s invasion of Kuwait. “They were surrendering faster than we could process them,” Kessel said. He had a captured general and was putting him in a Humvee, and a soldier had left an M-16 rifle on the seat. “He hands me the M-16, he says, ‘Here sergeant, I don’t think I need this where I’m going.’ It was very gentlemanly,” Kessel said. 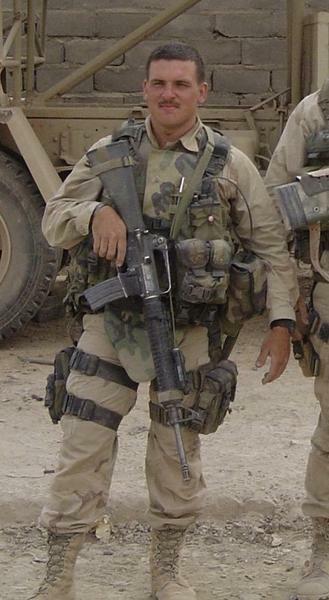 Kessel also served in Operation Iraqi Freedom from 2003 to 2005. The situation had turned around. With the enemy knowing a huge U.S. force was en route — it was all over television news — Kessel’s unit was moving to the front lines in April. “It started out rough. They were waiting for us,” he said. In the morning, his unit had taken control of the area. One wounded soldier got a gruesome gift. “We were able to recover the round and give it to him as a souvenir,” Kessel said. Over the course of the next several days, there were multiple ambushes ahead of the hard-fought Battle of Holy Week. Kessel thought about it for a while. “I’d gone to bed and prayed, and said to God, ‘I need help. We can’t put up with this for a year,’” Kessel said. “I do believe it was the Holy Spirit. On Easter Sunday, that’s exactly what we did,” Kessel said. But on Christmas Eve 2004, he was hit by an improvised explosive device in a city north of Baghdad, Tarmiyah, near the Tigris River. His troops were told to look for a man who’d murdered U.S. civilian contractors. Kessel believes, based on photos, he’d found that man. But he disappeared. And Kessel thinks that’s when he became a target. His Humvee was traveling at 50 or so miles per hour when the bomb went off. “The last thing I remember was a donkey staked down on the side of the road,” he said. When his vehicle lined up with the donkey, a cell phone set off the IED. “They put the bomb on the wrong side of the road,” he said. He was able to get the others out of the vehicle and only years later was told he had suffered a concussion from the blast. He still has bomb fragments pulled out of his totaled vehicle. With a new vehicle, Kessel continued the mission. Some 25 percent of his men earned Purple Hearts. He married Alicia in 1997 and works at Edward Jones.